Inverewe Gardens, originally uploaded by debdooblah. In my last post I highlighted some of our favourite things to do in and around Achiltibuie. Here I complete the top 10 list. 6. Visit the National Trust Gardens at Inverewe. This is a magical place. Not far as the crow flies but a fair drive back past Ullapool, a visit to Inverewe would be a full day out from Achiltibuie. In 1862 Osgood Mackenzie set about transforming this barren lochside gardens into a lush and tropical oasis. In spite of being further North than St Petersburg, Inverewe benefits from its own micro-climate and the warm Gulf Stream. Palm trees, exotic plants and a beautiful walled garden. 7. Have dinner at the Summer Isles Hotel Hotel. I plan to do a further post on the hotel shortly (I think my Great Great Uncle helped to build it) but the Summer Isles is probably one of the most remote Michelin starred restaurants in the country. The hotel has recently changed hands but I believe the chef – Chris Firth Bernard – is staying. I have only eaten there a handful of times but the food is exceptional, and the views from the dining room as the sun sets over the islands would rival any in the world. Booking ahead is essential and because priority is given to hotel guests it is not always possible to get a table unless you are staying. The bar is also good for a lunch and often has left over puddings from the restaurant. 8. Rent a days fishing on one of the lochs. There are a wide variety of lochs and rivers to fish in the area. 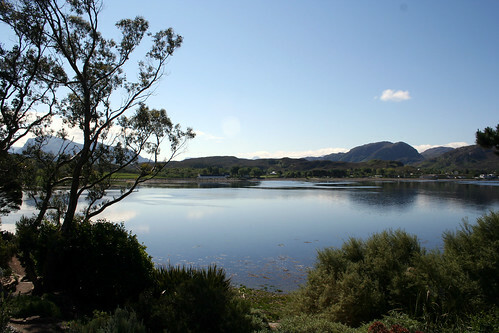 Call either the Inverpolly Estate on 01854 622 452, the Badentarbet Estate on 01854 622 225 or enquire at the hotel. A variety of brown trout, sea trout and salmon fishing is available. As a kid my favourite was to get the night-time beat on the Garvie river with my father. 9. Sea Kayaking. A bit of a cheat because I have never done it myself but it looks great and there are guided trips in the area. On my list of things to do and I bet it is spectacular in good weather..
10. Go to an evening event in the Coigach Hall. The (relativly) new village hall is within a short walk of our house. Regular dances, bands and other attractions are booked in. See the Ullapool News for the latest schedule or visit here. That’s it – my top 10 things to do in Achiltibuie & the surrounding area. I’m sure others with different interests will have further favourites to add. Please do so in the comments section below or on part 1 of this post. We are going to Ullapool for a day. We will drive from Gairloch to Ullapool. Can you recommend some nice place for lunch on our way to Ullapool. Also, what all should we do there considering we have a day only. Thanx! The drive itself is a beauty but in all honesty there’s not much along the way. I’d be tempted to have some time at Inverewe Gardens and maybe lunch there. You could also stop at Corrieshalloch Gorge along the way. In Ullapool itself it depends on when you arrive. The Ceilidh Place is good for food – it also has a good bookshop. You can walk the hills above the village for great views over Loch Broom or just stroll around the harbour. You forgot to mention the Achiltibuie Hydroponicum Gardens. It’s an amazing place and they make really yummy cakes. Also for me sea kayaking would be at least within the top 3. The summer Isles are a cracking place for sea kayaking.